When sportsmen make the news for the off-field activity, its normally for all the wrong reasons. However, it will be difficult to find anyone that is not applauding basketball superstar LeBron James' latest move. He has opened an $8 million public school in his hometown of Akron, Ohio for at-risk students. The I Promise School will be home to 240 at-risk students, offering free tuition, free uniforms and free bicycles and helmets for each student. The school will also offer free transportation within two miles and guaranteed tuition to the University of Akron for every student who graduates. There is also a seven-week summer session that will provide STEM-based camps. Forty-three staffers will help run the I Promise School — including not just teachers but also a principal, assistant principal, four intervention specialists, plus a tutor, English as a second language teacher, music instructor, and gym teacher. Classrooms will hold 20 students per teacher. The I Promise School is a joint venture between The LeBron James Family Foundation and Akron Public Schools. The creation of the curriculum was overseen by the school board and it will meet educational standards, while LeBron served as the primary donor to help shape the outside-the-classroom goals of the school. It will also offer a "support circle" for students, General Education Development courses and job placements for parents. 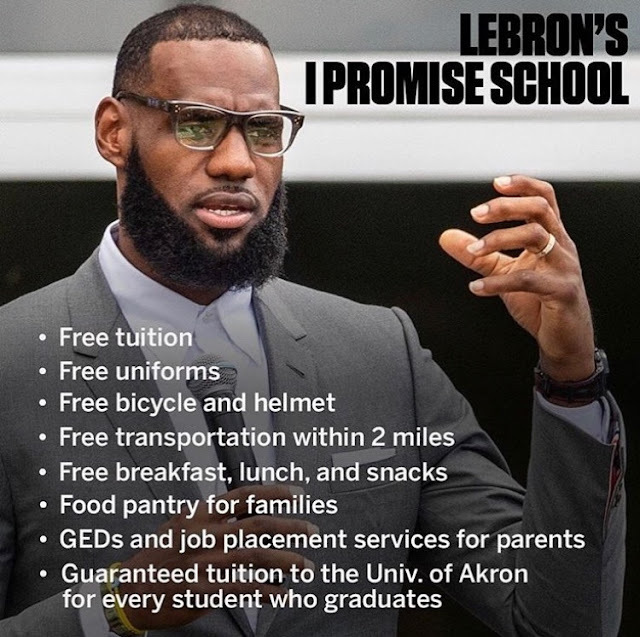 When asked why he's building the school, Lebron said, "everything these kids are going through - the drugs, the violence, the guns, everythng they're going through, I know. For me to be in a position where I have the resources, the finances, the people, the structure and the city around me - why not?" Nothing but total respect from the team here at Sharp Guy for this incredible act of philanthropy. If more sportsmen where more generous with their resources, maybe we'll be a step closer to solving many of the problems in our world today.